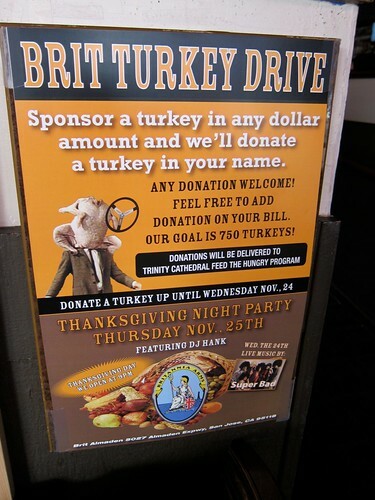 Yesterday, my husband John and I were at Britannia Arms pub (5027 Almaden Expressway, San Jose CA) with a crowd of other wet volunteers helping with their 8th annual “Brit Turkey Drive”. 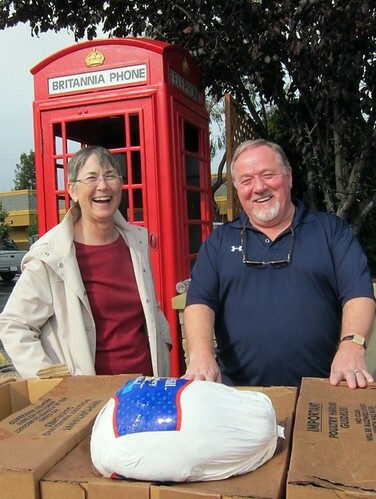 * Michael North and John McKay and pub regulars collected enough donations to buy 700 Thanksgiving turkeys to distribute to the hungry of our community. 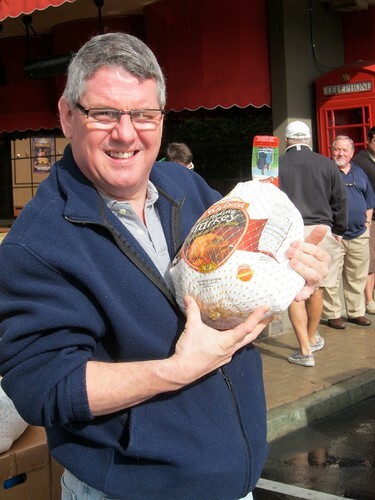 The turkeys and other food will be given out through the programs of Trinity Episcopal Cathedral and Santa Maria Urban Ministry (SMUM) of San Jose. 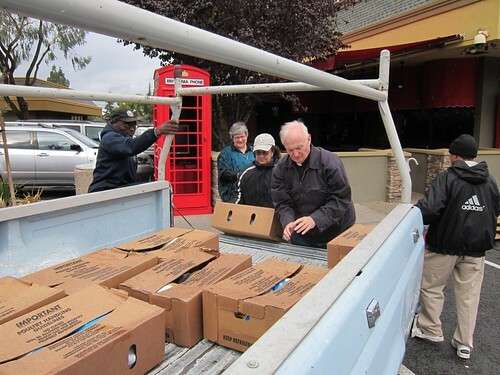 Dignitaries helping with yesterday’s delivery and distribution included The Very Reverend David Bird (Dean of the Cathedral), San Jose Vice Mayor Judy Chirco, and SMUM’s Executive Director, Rev. 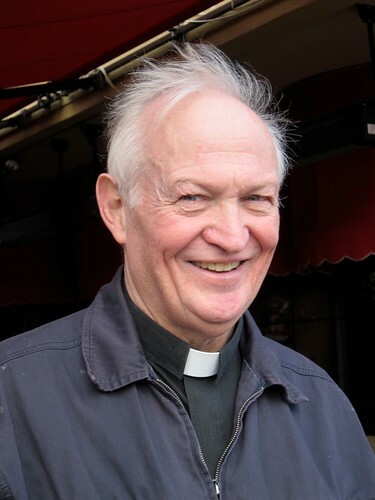 Lawrence Robles. Channel 7 ABC news was there to film the story. There were several dozen individual turkeys waiting in the freezer of the Britannia Arms but the morning’s drama was provided by the arrival of four large pallets of frozen birds emerging one by one from the frosty mist of a large delivery truck. 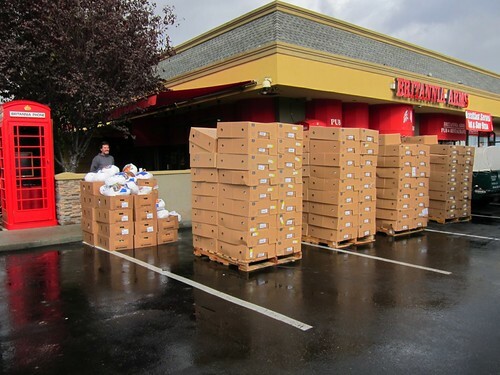 Within minutes of the last touchdown on the parking asphalt, individual turkeys and boxes of turkeys were passed from arm to arm into the backs of cars and trucks driven by volunteers to the programs waiting to distribute them. Three cheers for the generosity of the Britannia Arms! 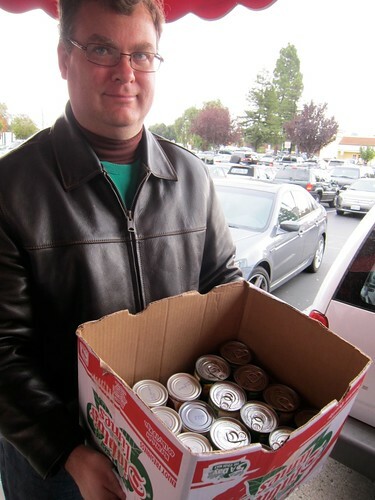 The Channel 7 cameraman said that they might be back to film SMUM serving a full turkey dinner to 200 homeless people under one of San Jose’s bridges – later this month. My comments on a recent post of Joann’s might lead you to believe that the marketing of Team San Jose’s recent website re-launch really set off my BS detector. And you’d be right. The main reason was, they sent me two or three emails to invite me to the gala grand launch party, without ever saying what they were launching. It sure looked like someone spending a big pile of money to hype the launch of something they themselves weren’t really sure was worth the excitement. Now it looks like the smoke and mirrors at Team San Jose might not be confined to their website launch party. The Mercury News and the Silicon Valley Business Journal are both reporting that Team San Jose is in some financial hot water with the city. The organization appears to have gone over its budget by $750,000. They couldn’t have picked a worse year for it, with the city trying to scrape together every nickel it can find, and making cuts left and right. A week ago, the city sent Team San Jose a sternly worded letter (linked from the Business Journal’s article), formally notifying them they’re in default of their contract with the city. Team San Jose’s books will be audited, and until the audit is completed, they’ll have to take extra steps to obtain payments from the city for their expenses. This week, downtown city councilman Sam Liccardo called for the audit to be expanded not only into the most recent $750,000 shortfall, but also losses between 2005 and 2009 amounting more than double the $9.8 million the city had agreed to subsidise, and liabilities the group may have taken on to promote certain other recent events like the Tech’s Genghis Khan exhibit. Scott Herhold in the Mercury called the audit a “nuclear option”, in comparison to the slap on the wrist the organization might have gotten if city finances were stronger. For myself, I think it’s about the least that could have been done. The city is making too many cuts to vital services and staff pay and benefits to let anyone spend three quarters of a million dollars of its money without accountability. Help bring Major League Baseball to San Jose by attending today’s City Council meeting. I just got clued in (thanks to Keye at the 13th Street Neighborhood Advisory Committee) to the City of San Jose’s “Preliminary Budget Reduction Proposals” document. This open memo, produced by the City Manager’s office about two weeks ago, outlines specific steps proposed to close the city’s $116 million budget gap. The proposals include cutting library branch hours to 3 days per week, closing 3 of the city’s 5 public swimming pools, closing restrooms in city parks, halting $1 million in funding to community outreach programs. In addition, 5 out of the city’s 34 fire engine companies would be eliminated, police patrols and “investigative services” would be reduced. The complete list of cuts fills more than 20 pages. It’s not really the individual cut-backs that scare me, its the enormity of the total package. If you are involved in the city, or you know people who are, you’ve probably already been asked to go to a meeting or email your councilmember to quash cuts to some particular program or other. Before you join in, though, first think about where would you rather see the budget axe fall. When you’ve got that in mind, then its time to make your voice heard. But even with all our voices raised to support our favorite city services, I think its safe to say we’re looking at a year ahead when nobody who pays any attention is going to be happy with city government. Catch the comings and goings of our favorite reality show couple, on the “Clara and Esteban Colbert Falcon” Webcam. Thanks to The City of San José and the Santa Cruz Predatory Research Group the sky is the limit for this pair of Peregrine Falcons. The transportation element for the San Jose General Plan Update specifies a variety of different types of streets, depending on their function. The Envision San Jose 2040 general plan update task force met this evening to consider transportation and water supply issues, with transportation taking up most of the meeting time. One of the key issues in transportation is to accommodate planned growth in the city without overwhelming the transportation infrastructure; and a key strategy to do that is to increase the use of alternate “modes” of transportation like walking and biking. 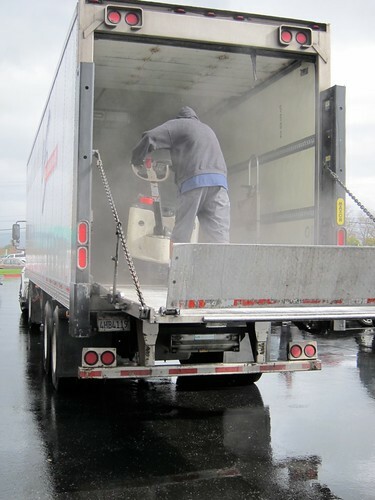 A report drafted for the city by consultants Fehr & Peers highlights some ways to do that, as well as laying out a plan to combine personal vehicles, alternate modes, and freight (trucking) traffic, with connections to rail and freeways for regional travel. San Jose is compared to other cities that lead in “mode share split”. For example San Jose has about 1.2% of its commute trips currently taken by bicycle, while Portland has 6% and Davis (just this side of Sacramento) has 14% bicycle mode share. San Jose has about 1.8% mode share for commuting by foot, while San Francisco has 10% and leading college towns like Ann Arbor and Berkeley have 16 or 17%. One task force member made an excellent point that the configuration of some of our streets makes cycling simply dangerous (imagine biking on Stevens Creek Boulevard, for example) and we’re unlikely to get cycling ridership up to match Portland, or the higher percentages the plan is targeting for 2040, without providing safe, separated cycling paths along such important routes. Which is not impossible, but it does require that the level of public subsidy granted to cycling infrastructure becomes a miniscule, rather than a microscopic, fraction of the subsidy already given to automobiles. Another issue pointed out was that the proposed general plan doesn’t take into account the new Master Bike Plan adopted by the city council in just the last few weeks. For example, certain roads are proposed to become “bicycle priority streets”, but there’s no mention of actual “bicycle boulevards” as were included as part of the primary bikeway network in the Master Bike Plan. Hopefully some work will be done to align the new general plan with the Master Bike Plan before it’s finalized. Overall I was glad to see that at least 80% of the task force members seemed to be on my side of this issue, promoting increased cycling (and walking) and improved accomodations for cyclists in San Jose, and I’m hopeful that the plan will go through as they discussed it tonight, and also be fulfilled by the city over the next 30 years. 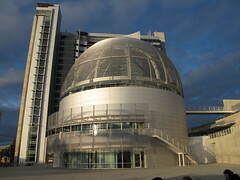 * The Morgan Autism Center, located in San Jose, is a non-profit special education program for children and adults with autism and other developmental disabilities. Founded in 1969 the center provides a very positive highly structured environment with a high staff to student ratio. A fun-filled evening of fine wines, champagnes and culinary delicacies. $100 per person – Tickets can be purchased at the door. Regardless of cause–autism, developmental disability, mental retardation, down syndrome, apraxia, and many diseases–TapToTalk can help those who are non-verbal or have other speech or learning challenges communicate and learn.